Location: Old Eldon Square, Newcastle. Materials: Granite, Portland Stone and Bronze. Status: Listed Grade II. 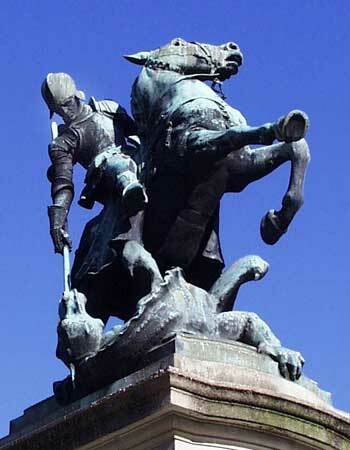 Charles Hartwell's bronze equestrian St. George and dragon occupy a tall Portland stone pedestal decorated by the bronze reliefs of Justice and Peace at each side and by a carved lion at the front. This St. George and dragon is the second cast of a sculpture designed and executed by the artist to commemorate the men of Marylebone killed in the Great War and which is situated close to Lords Cricket Ground. Such a cost saving measure was common at all periods of memorial making where casting techniques were involved. The memorial, which was paid for by public subscription, was unveiled by Earl Haig in 1923. In 1974 the Council's proposal to remove it from Eldon Square to a new site caused a public outcry.